Shopping for an engagement ring can be either an easy enjoyable day out for a couple or a gentleman planning a surprise, or it can be a nightmare of epic proportions with the unsuspecting shopper trying to come to terms with an overload of information. Here are some engagement ring shopping tips to help you become more familiar with what to expect. Knowledge is power but it can also become a hindrance with some shoppers trying to tick all the boxes and running into the danger of overlooking some unknowns that can invariably affect the price of an engagement ring. At Loyes Diamonds, we prefer to use 18kt gold as we feel it is the most durable and looks the best. 24kt Gold is pure gold but it is soft and is not suitable for jewellery. With 18kt gold you have the beauty and preciousness of gold with the strength and durability of the alloy used. 18kt means 75% in layman/woman’s’ language and the other 25% or alloy is a metal added to the base metal (gold) for strength, durability and colour. If 25% is copper added to gold you get 18kt Rose gold. If 25% palladium is added to gold you get 18kt White gold. If 12.5% silver and 12.5% copper is added to yellow gold you get 18kt yellow gold. Some facts to consider when thinking about the metal for your engagement ring. White gold stays fresher looking for longer than Platinum. Platinum turns to a steel like colour over the course of a few months whereas white gold will stay bright for 12-18 months. Platinum weighs more than gold. At the time of writing this Platinum is less expensive than gold but because it weighs more, when you multiply the spot price by the weight of the metal used it will be more expensive a choice for your engagement ring. Platinum rings have 95% platinum in them. Gold rings have 75% gold in them. There is more of the precious metal in a platinum ring than gold in a gold ring. White gold rings have a covering (plated with) of Rhodium (brightest member of the platinum family). Platinum rings will need to be polished every 12 months to bring back the original shine so it’s important to keep that maintenance element into account when purchasing. Unless of course you like the understated look of a steely grey ring. High street stores will in the main, promote Platinum over white gold as there is more mark up in terms of profit on platinum. Rose gold and yellow gold have little or no maintenance except for a polishing every couple of years. White gold rings will look like the day you bought them every time you get them re-plated. Top tip! You should have your rings checked every 12 to 18 months to ensure settings are secure and always have your rings insured. The 5th ‘C’ – Certification. Before we jump into the 4C’s of a diamond we would like to make you aware of the 5th C.
The 5th C of a diamond is the Certificate of the diamonds. That is to say, ‘who has certified the diamond?’ and should we listen to their judgement. After a diamond is mined and cut/polished, it goes to an independent laboratory to be examined and graded by the laboratory and given its cert. The laboratory is independent of the mines and the wholesalers and gives their view on that the diamond should be graded as. As with everything else there are good/reputable laboratories that are recognized by those in the diamond industry and then there are other laboratory’s/cert issuers that are shunned/not recognised by the diamond industry. It is highly recommended that you stick with the most reputable of these certified stones. 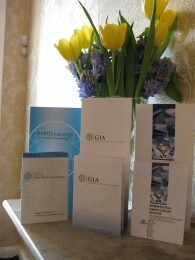 • GIA (gemmological Institute of America) is the best known but most expensive. • HRD (Antwerp based lab) many consider on a par with the GIA. • IGI (International Gemmological Institute) – Very well respected but just a shade behind the two above when it comes to grading e.g. a Si2 Clarity Graded GIA stone will likely be graded as a Si1 clarity Grade on an IGI cert. IGI stones are usually slightly less expensive. The 4 C’s of a diamond – Colour, Clarity, Cut, Carat weight. At this point we would like to stress that the 4 c’s of a diamond are not the be all and end all when buying a diamond. Although two diamonds may have the exact same certificates as each other the actual diamonds may look different to each other upon inspection. This can cause much confusion and also a difference in pricing between two stones with the same certificates. The 4 c’s is to be used as a very helpful and accurate guide to what you are paying for but only a qualified and experienced diamond expert will be truly able to separate the two from each other. This skill can really separate the beautiful from the ‘exceptionally’ beautiful. Diamonds colour grades run from D at the highest to Z at the lowest. D, E and F are colourless diamonds and are the rarest and most valuable. G and H are near colourless and can be a wonderful choice for the purchaser who would like a larger stone and would prefer to put their budget into another area of the stone such as carat weight. At Loyes Diamonds we sell all colours with D to G being the most popular choice. Beware of jewellery shops’ lighting as it can distort the true colour of a stone. Jewellery shops invest hugely on their lighting systems. Top tip! Ask to see the stone in natural light. This is an aspect of the stone where most people tend to feel the need to go overboard and thus the costliest mistake people make when choosing a stone. Let me assure you that when purchasing a stone there is absolutely no need to look at flawless or VVS or even VS stones. The terms sound nice but believe me when it is explained to you in person what the terms and effects on the light are you will quickly learn that you are paying for something that is overkill and need not be. If it’s sparkle you wish to achieve, it is the cut that you must focus on. You have heard the saying “the three most important factors when buying a property “location, location, location” …well with a diamond it should be “cut, cut, cut”. This is the single biggest effector of sparkle, fire, brilliance and scintillation. The ‘cut’ of a diamond is graded as Excellent, Very good, Good, Fair and Poor. At Loyes Diamonds all our diamonds have cut grades of Excellent or Very good. This ensures that the diamond will perform to its best and perform with maximum fire, brilliance and scintillation. It should also be noted that even though two diamonds have excellent cut grades on their certificates, there will always be one that looks better than the other. Diamonds are bought and sold by the carat. The film industry has focused over the years on the diamond carat weight and although it is a huge factor in the price of a diamond it should not be the all-encompassing factor in purchasing a diamond. For example, there is little point in having a 1 carat diamond that is cut incorrectly and will not perform correctly (looks dull) rather than having a .80ct or .90ct that has an excellent cut a will sparkle forever more. This is a factor that although it is written on a certificate many people do not see. When buying a diamond, the fluorescence in the stone may alter the price as much as 30%. Unsuspecting shoppers may wonder why a diamond is priced so much less than another stone and not realise that the stone has strong fluorescence. Fluorescence is the reaction the stone has to ultra violet light. Stones with fluorescence will glow blue when placed under blacklight or UV lights. Diamonds that possess fluorescence will seem like any other diamonds but then they are placed in direct sunlight may look cloudy or milky…almost like you stepped out of a shower and the stone has fogged up. The grading system for fluorescence ranges from NIL, FAINT, MEDIUM, STRONG, VERY STRONG. Almost all of Loyes Diamonds stones are nil fluorescence. How Does the Engagement Ring Look with A Wedding Ring? This is a factor that few think about when buying an engagement ring. Thinking ahead your engagement ring will be matched with a wedding ring and most ladies would like to have their wedding and engagement ring fit snugly against each other. Some engagement rings where the centre stone is low-set do not allow for this to happen and will require a shaped wedding ring. Most people prefer to get a straight wedding ring as it can be worn by itself if the need should be. It is recommended that the metal used in both the engagement and wedding rings should remain the same e.g. gold with gold or platinum with platinum. 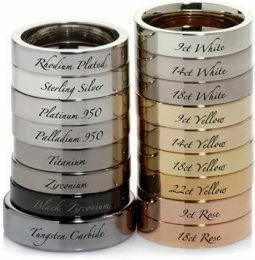 There are no rules regarding the colour of the gold in the rings and although most ladies choose to keep both rings the same colour, some opt to mix things up with one ring being white gold and another being rose gold etc. Our advice would be not to buy online. Although the prices are attractive the rings may not be. When buying online you are really buying the cert and not the stone and even though two stones may look the same on paper, they will not be the same when viewed before one’s eyes. If something goes wrong with the ring it is far easier to approach a jeweller, you have dealt with in person than risking sending it to a company that you have only had contact with over the internet. It is so difficult to judge what will look good on your finger and only when you buy a ring by trying it will you get that ‘I love it’ feeling. If men are going it alone and buying a ring to surprise their girlfriend/partner, it is far easier to bring her back into a jeweller to exchange the ring if she doesn’t like the style. The Style of The Ring. 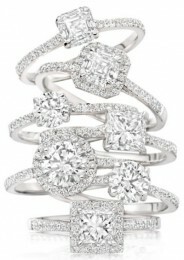 There are so many ring styles to choose from and beauty is in the eye of the beholder. Some of the styles available include Solitaire, Solitaire with diamond shoulders/band, Trilogy rings (three stone rings), 5 stone rings, 7 stone rings, Antique settings, Illusion rings, Coloured stone rings. Each category mentioned above also can be categorised further with stone shape and size. The most popular shape of a diamond in the centre of a ring is a round brilliant shape. Other shapes of stones may have a different desired effect depending on the type of hand the lady has. A Marquise shape diamond or a Pear or an Oval shaped diamond may complement long thin fingers but may also create the effect of having longer fingers. An Emerald cut will also have the same effect. It is only by trying on a variety of rings can the decision be made by the wearer as to what looks best. If going it alone to surprise your partner, we recommend you keep it somewhat conservative unless you have been given ‘subtle’ hints as to what would be acceptable. Do a little research – knowledge is power, but Google will only offer so much, and a reputable jeweller will offer far and quite often dispel myths and misinformation. Decide on what metal you would like for the ring. Explore different styles and follow your gut instinct…it will never let you down. Have in mind what your budget is and only spend what is comfortable to you – Most reputable Jewellers will be able to tweak certain aspects (within reason) to make that dream ring come true. 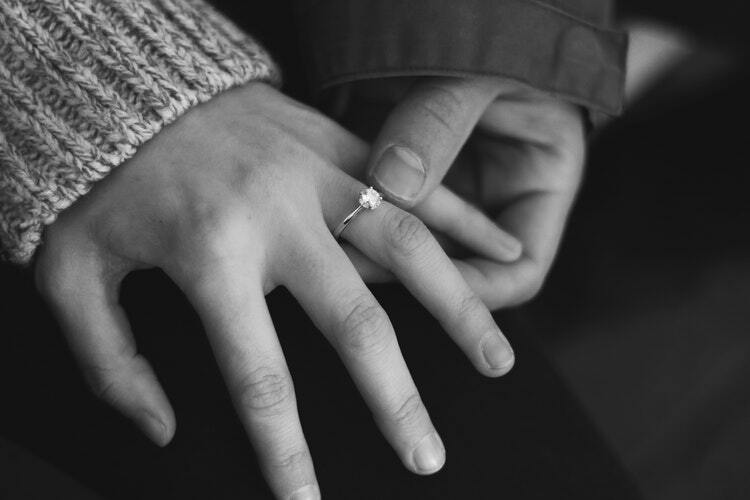 Rings can always be exchanged or even refunded but with the help of a reputable and experienced jeweller like our team at Loyes Diamonds, we would hope to get it right first time.